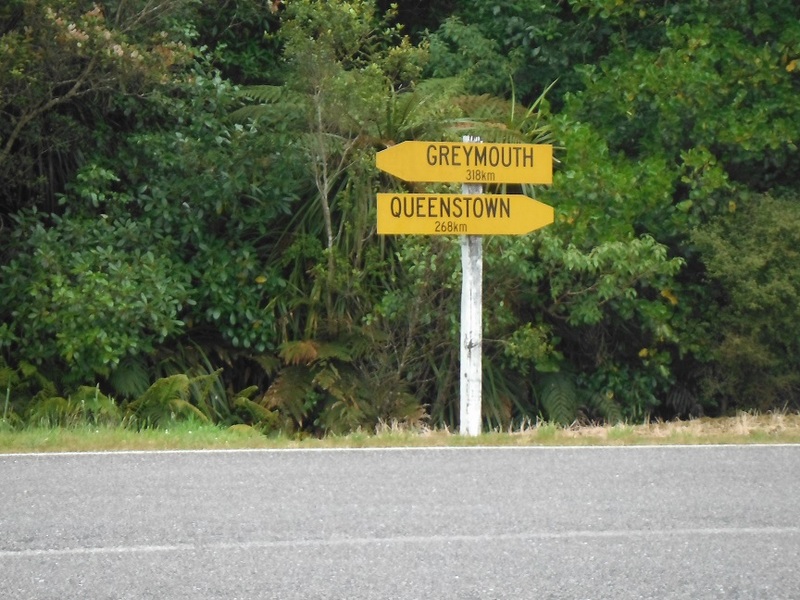 Last time we cycled in New Zealand we didn’t make it to the west coast of the South Island. 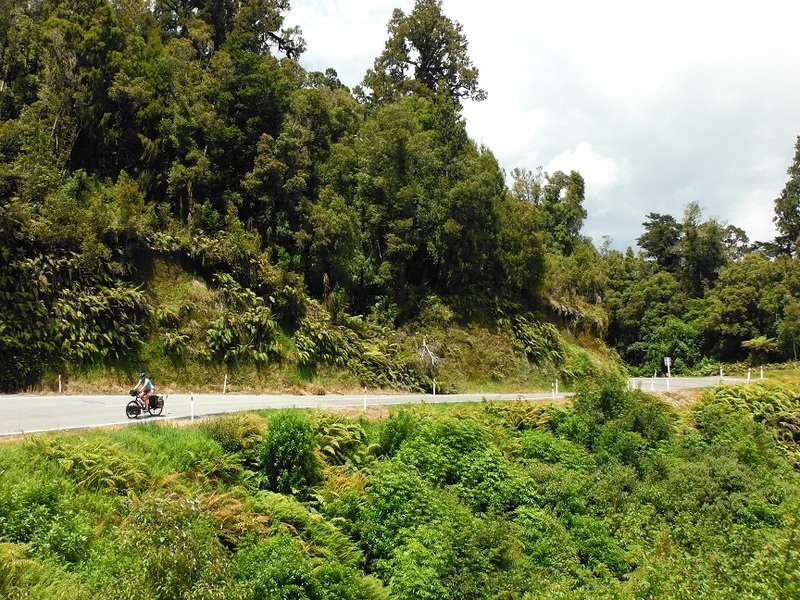 Everything you hear makes it sound a must-see – glaciers, rainforests, beaches, quiet scenic roads – apart from the one fact that it rains there. A lot. 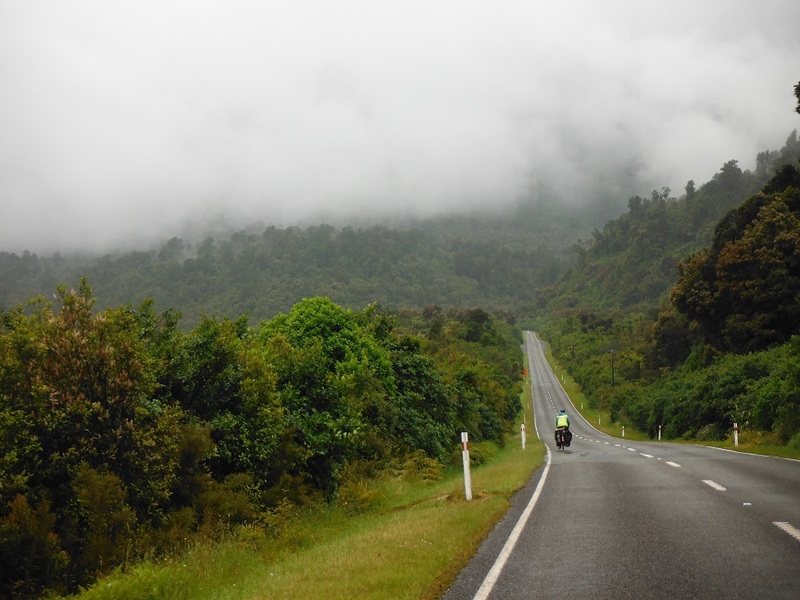 The Southern Alps that run down the spine of the island do a great job in trapping all of the rain and cloud, depositing it on the west coast and keeping the other side of the mountains nice and dry. We thought back to Oregon in September when we had a stretch of a week or so where it rained every day. 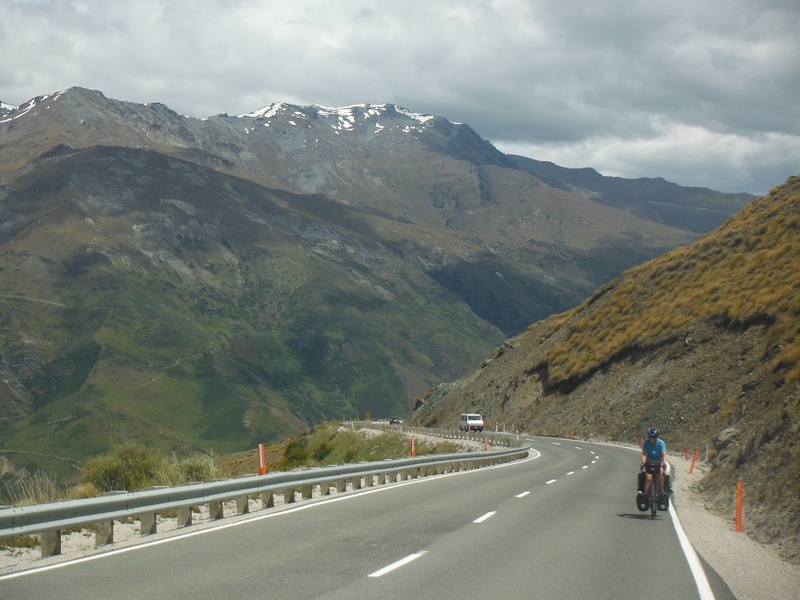 Not only does this make everything in our current way of life (cycling, cooking, camping, stopping to pee) harder but it also pretty much ruins the good views that are supposed to be the reward for the effort put into cycling. But hey, it can’t always rain. 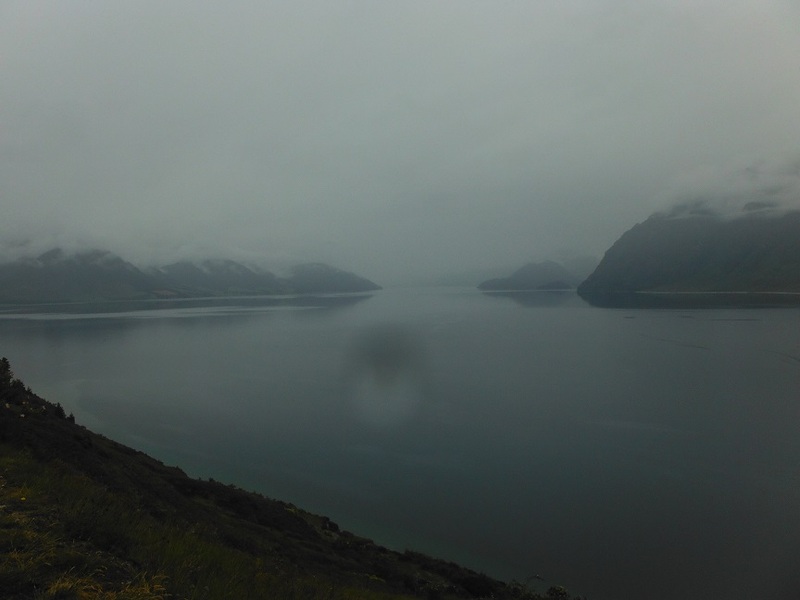 We crossed our fingers and rode towards the rainy coast, determined to see a glacier or two. 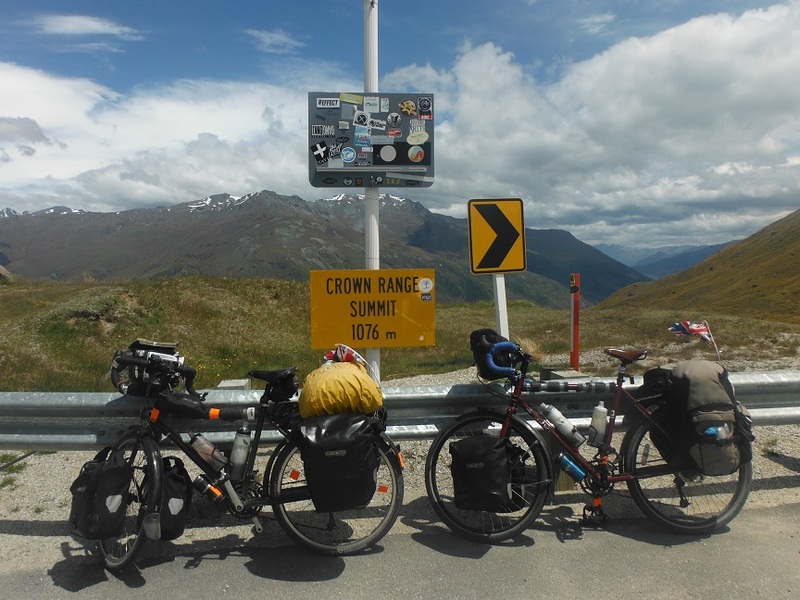 To get to the west coast from our rest stop in Queenstown we first had to get to Wanaka by riding the highest paved through road in New Zealand, crown range road (that’s now two countries we have ridden the highest paved through road). 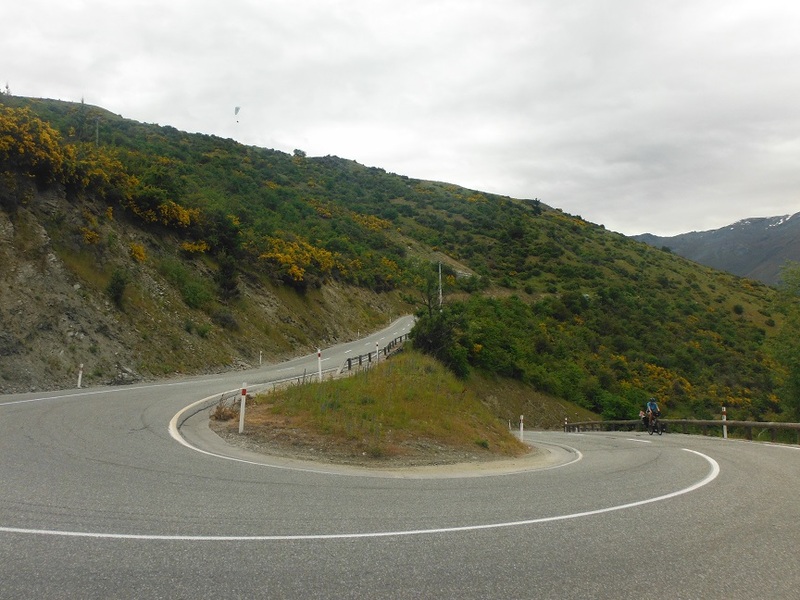 It is crazy steep, the start involves switchback after switchback up the side of the hill, and then it snakes up to the top of the pass so steeply it was almost impossible to push the pedals round. 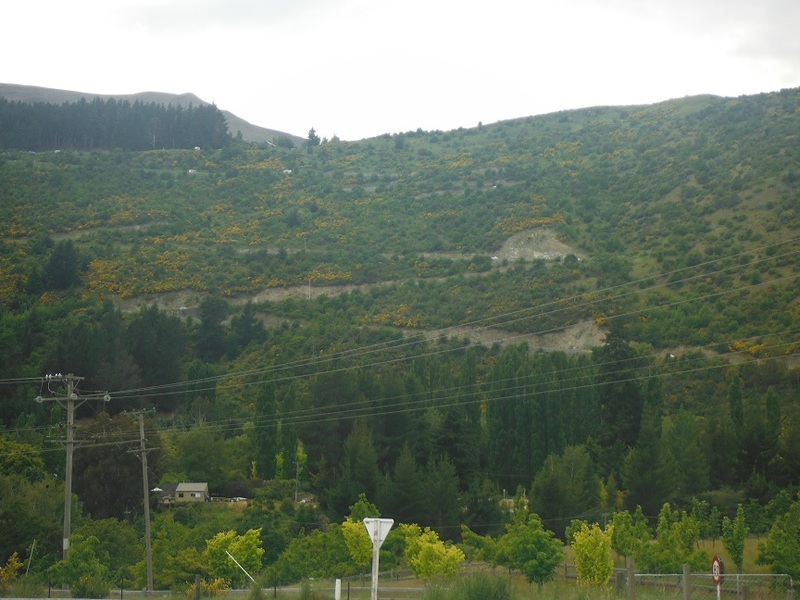 The scenery is pretty barren up to the top, though the gradual descent down the other side follows a pretty cool gorge for a while and passes through Cardrona, famous for its old hotel. But the gradual descent was totally ruined by a vicious headwind. We arrived in Wanaka at 6pm shattered and out of the three campgrounds in town, chose the pricey one with a hot tub to soak our weary muscles. 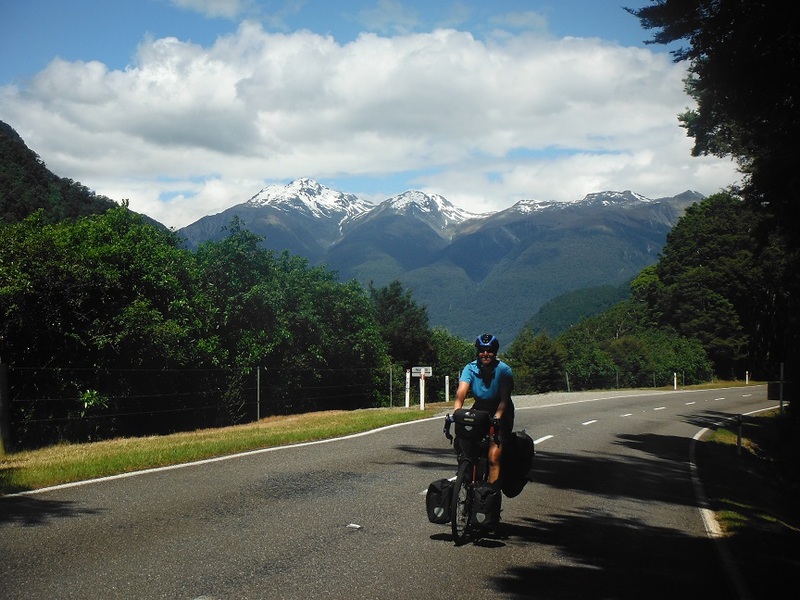 From Wanaka it was two days riding to Haast on the west coast. 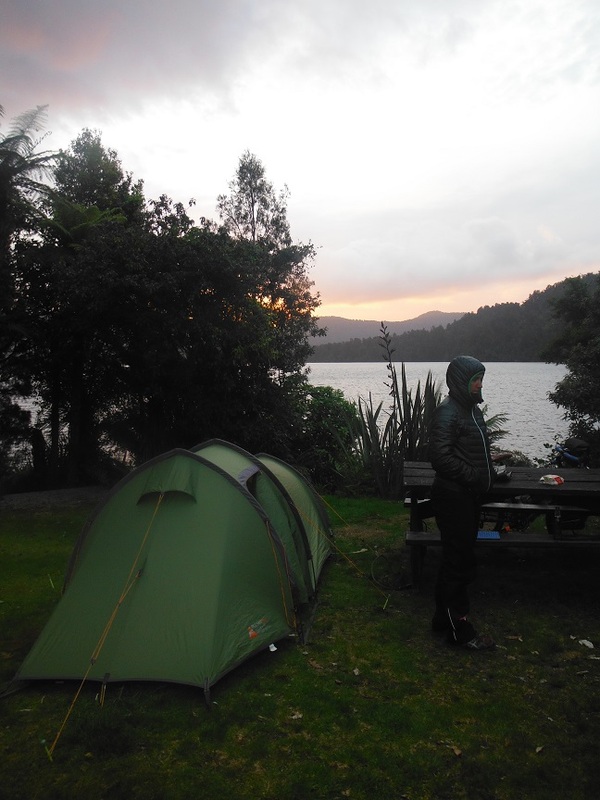 We were tired from the previous climb and it was pretty miserable so on the first day we stopped and put the tent up at 3pm by a lake and sheltered from the rain and the sand flies for the afternoon. 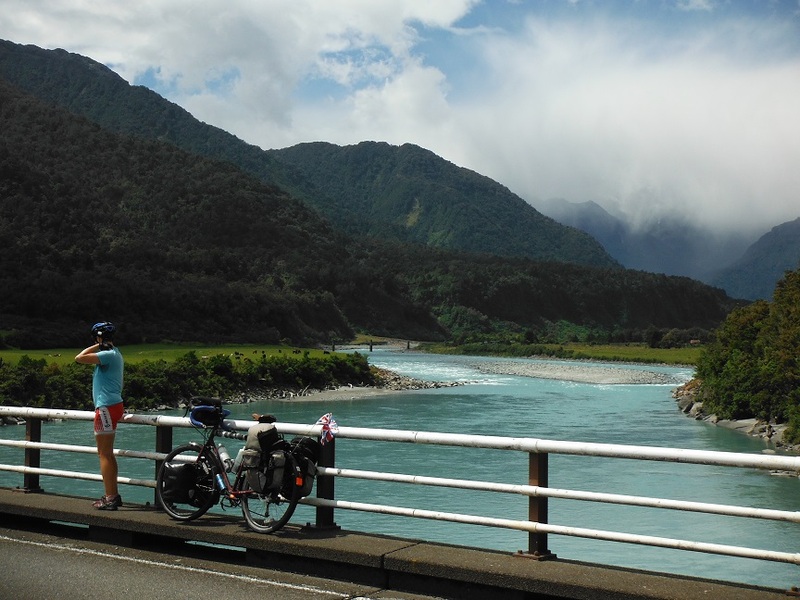 The following day we had Haast pass to climb, but it wasn’t too bad, much helped by passing an organised cycle ride and being invited into their lunch tent. We were told to take as much as we wanted as they were throwing the rest away; loving food and hating waste like we do we ate a huge lunch and carried as much as we could for dinner that day. Then sadly watched the rest be thrown in the bin. If anyone ever says there’s no such thing as a free lunch, remember this story. Keep the faith. Luckily it was mostly downhill from there as we were so full we could hardly pedal, the sun came out and we caught a rare glimpse of the mountains surrounding us. 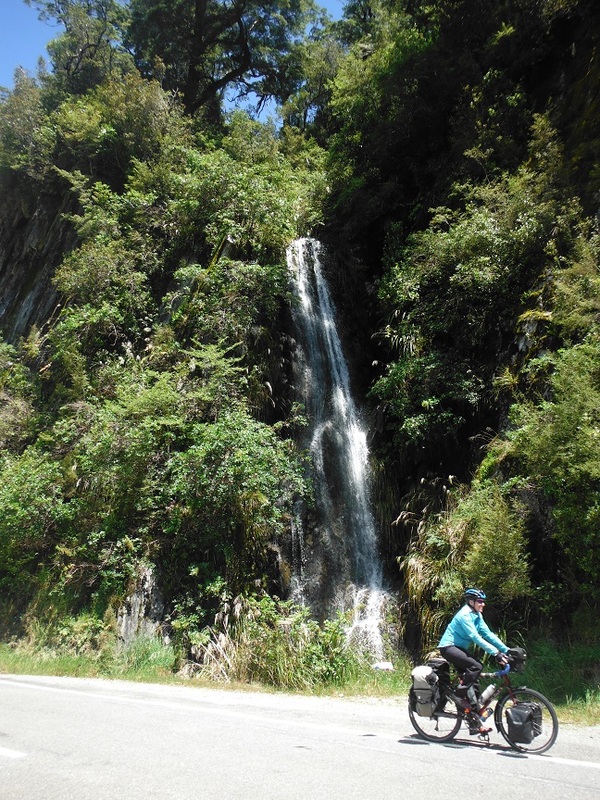 There were loads of waterfalls just by the side of the road and we were reminded of the beauty of travelling by bike as we could hear them roar before we saw them. 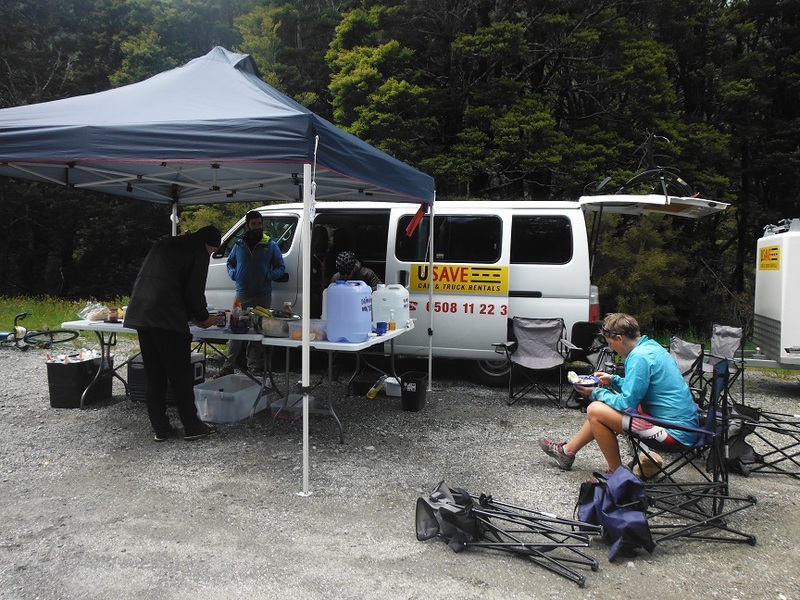 We arrived in Haast under blue skies, ate our free dinner and went to sleep hopeful that we had hit some decent weather. It was not to be. The next morning there was low cloud all around us. The mountains that we had seen in existence the day before had disappeared. 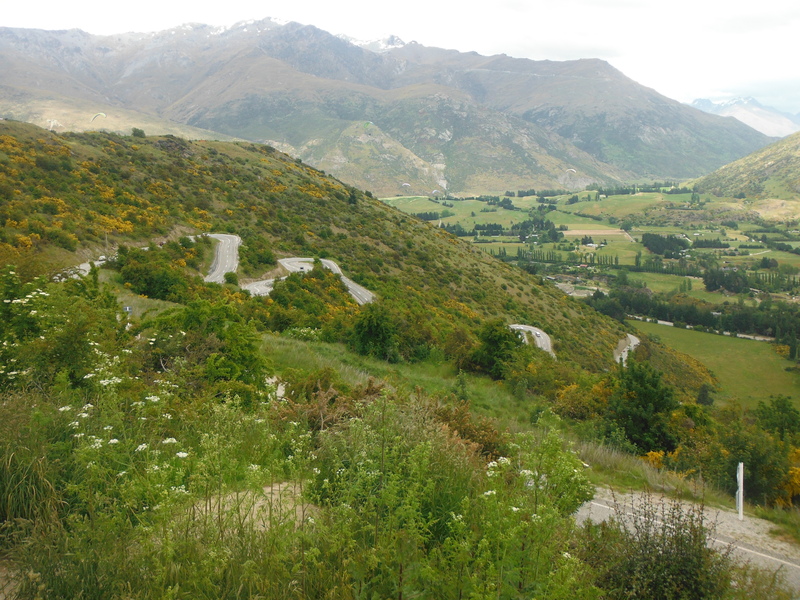 The road was seriously steep; this section of road is over difficult terrain and wasn’t completed until the mid 1960s. It’s nice to get reminders like these of how young the infrastructure of this country is. It’s easy to take for granted the amount of really old stuff we have in Europe. 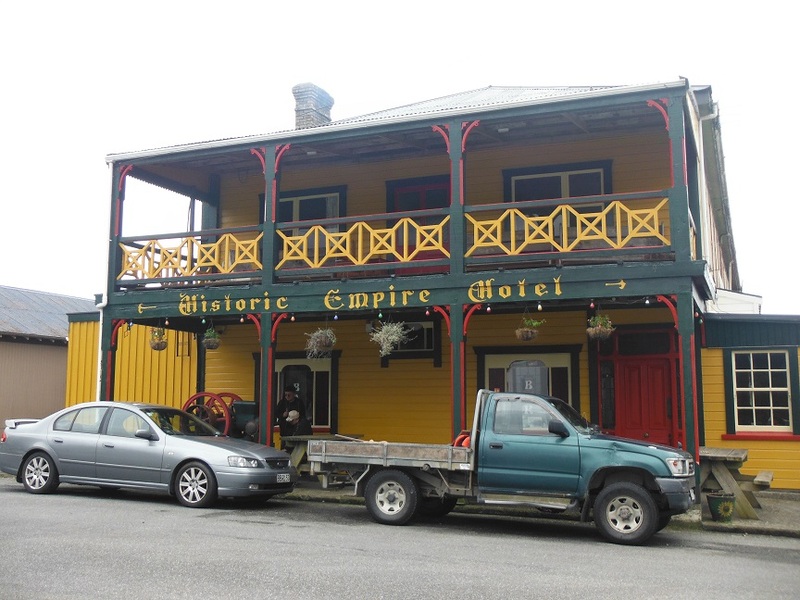 There’s old stuff to see in New Zealand too but it’s all natural – the oldest buildings are 19th century. In contrast, there’s a church in our small Leicestershire village from the 14th century; this is quite normal. 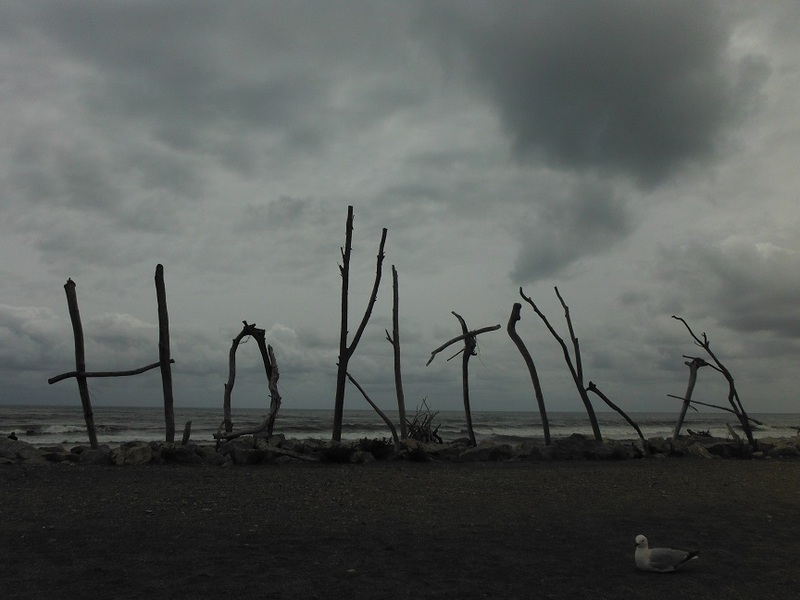 Anyway, the cloud made everything quite dreary, the road was mostly inland with no views of anything and as we arrived at a motel/campground and asked about pitching the tent, the owner said “you know it’s going to p*** it down?” We did know that, we camped anyway, and yes it p***ed it down all night. And all the next morning. In preparation we had booked a room in a hostel in Fox, a tiny tourist town that has little apart from hotels and companies offering helicopter rides to the glacier. Not on that day. We rode through the rain and checked in to the hostel bang on 1pm, the earliest check in time, dripping all over reception. I don’t think the staff were that excited to see us, especially when we handed over an armful of damp cycling clothing for them to hang up in their laundry. The afternoon was spent getting everything dry, making tea in a tea pot, and laying down. It was great. Later I ventured out to buy an ice cream each, though for the same price as two individual ones, I could buy a 2 litre tub – no brainer. (This is not uncommon across the world and only encourages over consumption, which is fine for cyclists (ok, debatable) but not for anyone else.) Luckily there was a freezer at hand so we didn’t have to eat it all that day. Scenic lunch shelter. You see these by the road, i think they are for kids to stay dry waiting for the school bus. 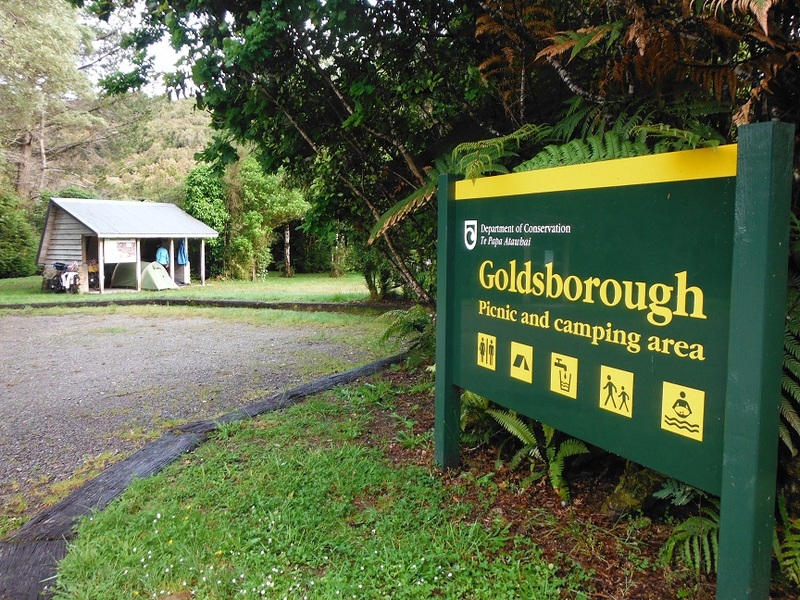 There are two glaciers that are (semi) accessible from the west coast road, Fox and Franz Josef. 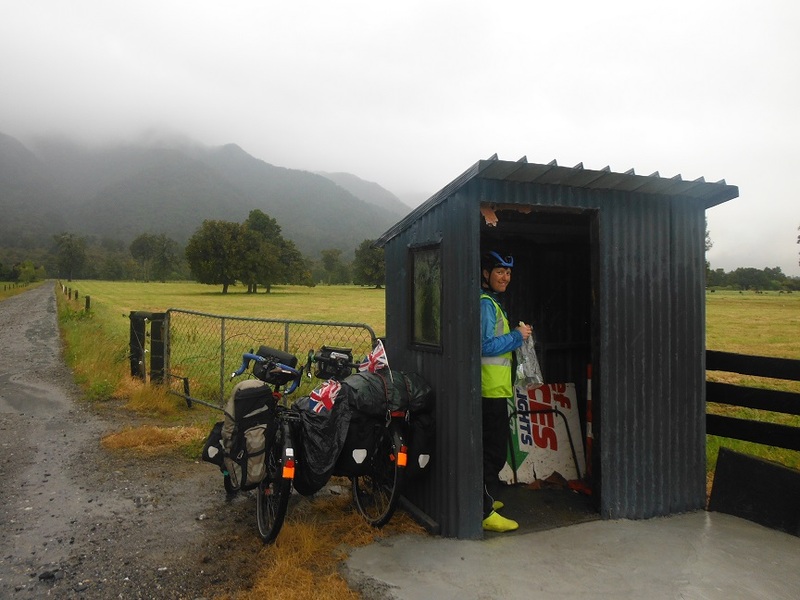 We didn’t see any reason going to see both (they are detours from the road), so as the weather was bad as we rode past the turning to Fox Glacier we put all our eggs in the Franz Josef Glacier basket and hoped for a bit more visibility as we rode north. The next morning it was a bit brighter, so we pedalled hopefully out to Lake Matheson, where on a clear day there is a picture perfect reflection of Mount Cook (the opposite side of the mountain to where we had hung out in perfect sunshine the week before). Unfortunately by the time we got there the clouds had swooped in again and the mountains were nowhere to be seen. Lake Matheson. The brochure view on the left; our view on the right. 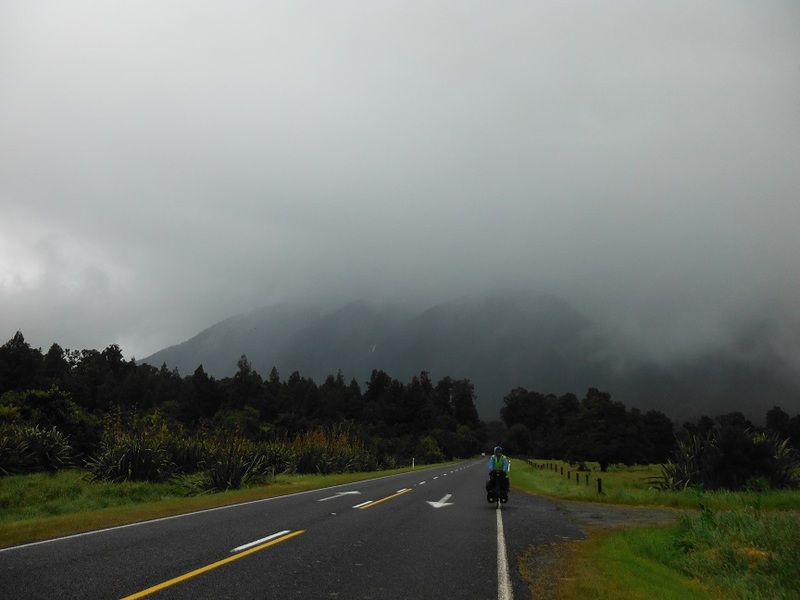 After calling back to the hostel for our stuff and to finish off the rest of the ice cream it was a twisty, hilly road to Franz Josef and it rained the whole time. Undeterred we rode the 5km detour out to the car park, locked our bikes and joined the hoards of other people in waterproofs to walk grimly out towards the glacier. Since 2008 the glacier has retreated around 800m so you can’t really get that close anyway now. We could hardly see anything so took a few terrible photos and walked back as fast as we could. Disappointing indeed. 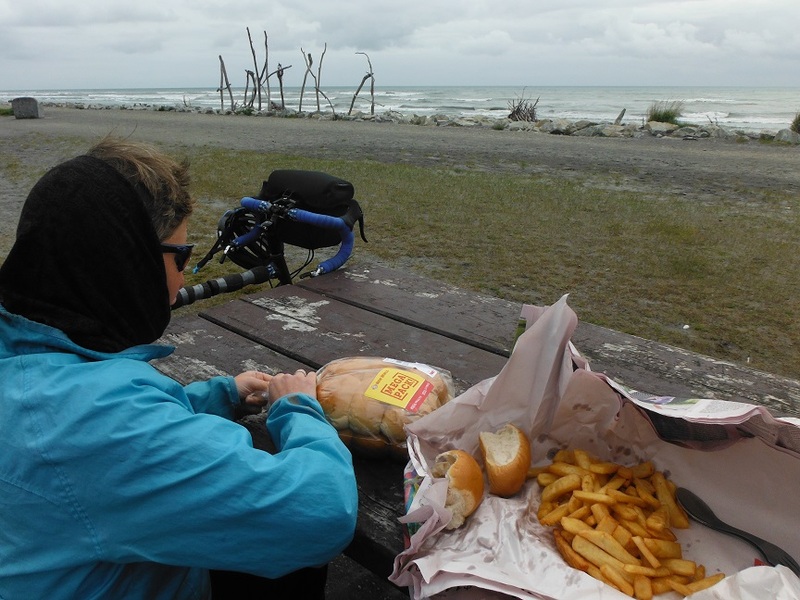 The best thing was that there was an undercover bike storage area where we could eat our sandwiches out of the rain. That night we camped at a lake near a couple of Aussies who gave us a beer and despite the cloud there was even a nice sunset. 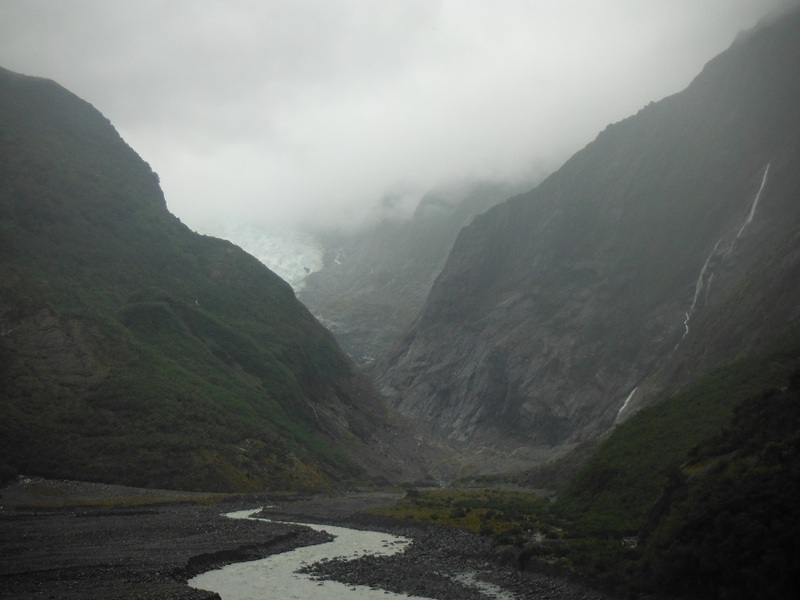 Franz Josef Glacier. Behind there somewhere. I think. Blue skies returned the next morning so we had some decent views and a good ride up the coast, though again the road is mostly inland so there’s not really much to see other than trees. It’s not that I don’t like trees. They just get a bit repetitive after a while. There wasn’t much to see, and we were even refused drinking water for the first time on the trip. In Harihari we stopped to read about the first person to fly solo across the Tasman sea (from Sydney, Australia). He didn’t think he’d get aviation permission for the flight so told everyone he was flying to Perth but flew over to New Zealand instead, half-crashing in a peat bog near Harihari and becoming a local hero. The scenery picked up a little as we crossed a couple of sparkly rivers before camping in Ross, a former gold rush town that once had 2500 inhabitants and now has 300. The old pub is quite quirky and has a camping/campervan area with a kitchen where every single other backpacker was making some variation of spaghetti bolognese. I think we saw five different spag bol meals prepared. We turned a few heads with our rice dinner. Debs even taught a German couple how to open a tin with her Swiss Army Knife. Revolutionary. The town occupied our interests for an hour or so the next morning as there are a few old gold-rush era buildings remaining. All in all I’m sure the west coast can be a spectacular drive/ride if the weather is right but I’m not sure we’d recommend it to cyclists. Although the road was pretty quiet, the grades are crazy steep at times, there’s not much to see on the way, you’re rarely near the ocean and the people weren’t super friendly. It’s good if you like trees and hills and don’t mind riding in the rain I guess. 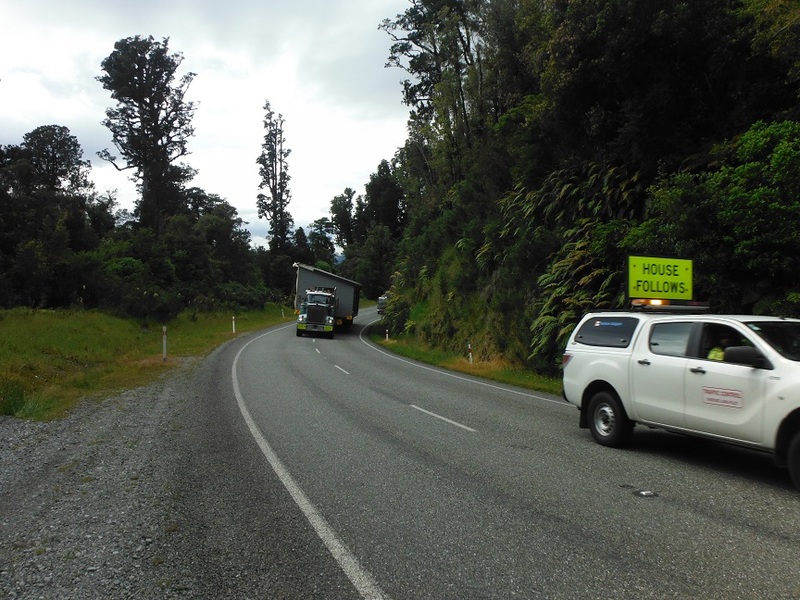 Or sharing the road with houses.